Walking Pilgrimage to the Shrine of Our Lady of La Leche, December 8-10, 2017. “Heaven is our home”. This was the constant underlying theme of our walking pilgrimage to the Shrine of Our Lady of Leche in St. Augustine, Florida. The first steps began on December 8th, Solemnity of the Immaculate Conception; and Our Lady of La Leche welcomed us on the final day of the pilgrimage, December 10, 2017. During these days a small group of pilgrims from all over Florida treaded on the intercostal shore. “Our hands are cold, but our hearts are warm,” a native-born Floridian smiled through chattering teeth, “Heaven is our home, keep walking, and don’t stop.” Every once in a while the pilgrims would look up at the ocean’s horizon and raise their hearts to desire the Eternal Shores of Heaven; and this is precisely one of the essential aspects of a pilgrimage. 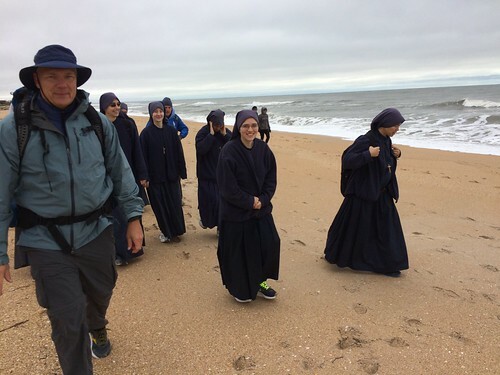 The walking pilgrimage, officially called “The Baby Steps Camino,” was organized by the Order of Malta, an American Association. It was done with the goal to raise money for Holy Family Hospital in Bethlehem, a maternity and neonatal critical care center located just 1,500 steps from the birthplace of Our Lord. “We pray it will also raise awareness of the poor and at-risk women and children at Holy Family Hospital,” stated Susan Egan, coordinator of the Baby Steps Camino. The truth is that everything that has to do with a pilgrimage does an immense good to the soul. It is a living parable of the time on earth that God has granted to us. First, it reminds us, as we said before, that on our earthly pilgrimage we are walking to reach our goal, which is ultimately heaven. Then, of course, a pilgrimage implies and demands a spirit of sacrifice. Let’s face it. It was definitely colder than most Floridians are used to. Not to mention that after day one, okay you’re a little sore, but then after day two? Let’s just say that you get a glimpse of what it’s like to be eighty years old. However, it is worth noting that when it comes to sacrifices, we have this tendency: to fix our eyes on the difficult part of the sacrifice. Yet, sacrifice has this other dimension: the eternal recompense for small things offered up with great love. Sacrifice also can help us to grow in the love of God and can be offered up for the salvation of souls. It is this part of sacrifice that we must remember when we are faced with difficulties in life. 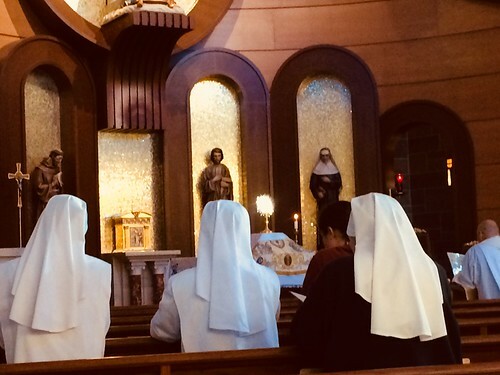 On Friday night, the Servant Sisters and a small group of High School girls headed to the home of a generous and hospitable family. The girls could only participate on Friday night because many of them had to study for the midterms they had the following week. Yet, it seems as though the Blessed Mother wanted to extend her motherly love to this family in particular. Their home truly reminded us of the home of Bethany, the home of Martha and Mary. 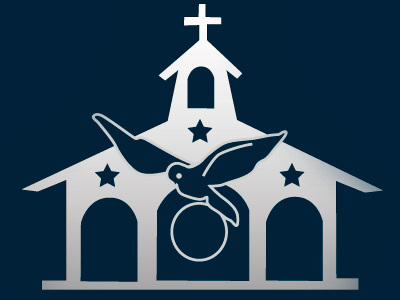 The Blessed Mother used it as a true center of apostolate. Family, friends, and neighbors of the family joined us for lunch and dinner so that they could meet the Sisters and hear their vocation stories. After dinner and games on Friday night, Lauren Scoto, Lay Member of the Home of the Mother, loving wife and mother of two little ones, shared her amazing testimony with the girls. She challenged the girls to strengthen themselves with a strong relationship with Christ in prayer and expressed the importance of setting fixed resolutions before entering into a relationship and holding firm to those resolutions. The first steps of our pilgrimage could not begin without receiving the Eucharist. Mass was celebrated in a parking lot near the beach off of A1A Highway. The original plan was to celebrate Mass on the beach, yet the winds were too high and we didn’t want to lose any particle of the Host, each particle is entirely Jesus’ Precious Body. As we walked, we united ourselves with the Holy Family, who without a doubt made their way along similar terrain to little Bethlehem. The walking pilgrimage was marked by fervent Hail Marys in various languages, uplifting conversations, and joyful singing, thus fulfilling the mandate of St. Augustine, “Keep walking and never cease to sing!” Nothing was wasted, everything was offered up so that the Blessed Mother could extend her blessing to all of her children in the way that she knows how. We also experienced that Sister Clare was with us and remembered that she had walked the same route on a walking pilgrimage in 2009.